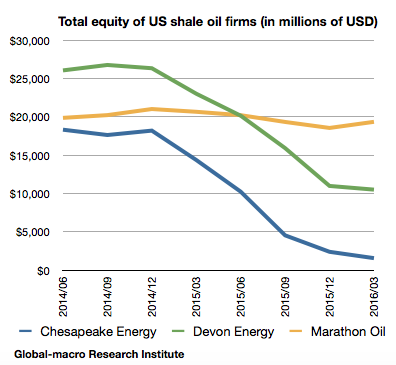 The shale oil firms have been making losses due to the oil market collapse. We observe how much it has made them financially vulnerable, as we look at the changes in their total equity (total assets minus total debts). Chesapeake Energy, the most financially vulnerable, is about to go bankrupt. According to its total equity that is still left, it could happen in the third or forth quarter of 2016, unless the management can take advantage of the current oil price surge very cleverly. On the other hand, the other two are successful in alleviating the decrease in their total equity, using such a means as issuing more company shares. As the first quarter was the time when the oil price was at the bottom, we could expect their financials start to improve later in 2016. They would not go bankrupt in 2016 and presumably also in 2017. Therefore, we could not expect a large amount of bankruptcies in the shale industry, except the most vulnerable. It is indeed decreasing from its top but still remains at the very high level. The most recent weekly figure of the supply is around 8700, suggesting it is still decreasing after the oil price rebounded. It takes time until the price surge affects the supply, and so the estimation of the delay would be one of the important factors investors should put into consideration. The production of Chesapeake Energy is decreasing as it had to sell a part of its equipment to pay its debts. However, investors should note that the equipment was purchased in order for buyers to use. It did not just disappear. It would be used when the oil price rises and thus it becomes more profitable. How high could the oil price go? If it takes time until the price rise promotes the production again, it is possible that the oil price could climb even further. For short-sellers, therefore, it is important to estimate its possible top as accurately as possible. The moves of the firms’ total equity give us a hint. It started to decrease in the end of 2014. According to their earnings releases, it was when the sale price of oils went below $70 that their total equity started to decrease. Therefore, $70 is the level where possibly all, even Chesapeake Energy, could revive without any problem, so $70 is not sustainable in a long term. 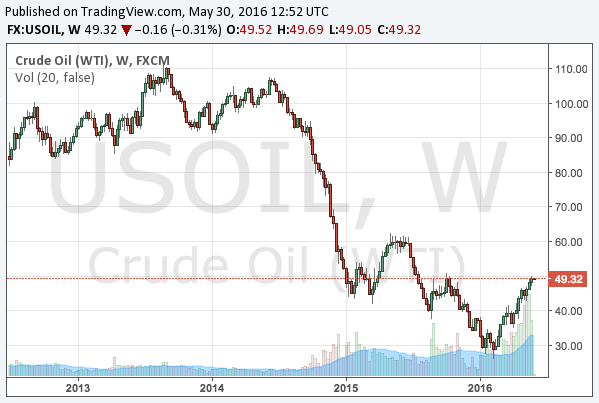 As the oil producers have been desperately striving to cut costs, so that level should be by now lower than $70. So we consider $60, which we assumed as the top before, is still the top that cannot be exceeded for a long term. There are, however, some concerns in a short term. The first concern is the ongoing decrease in production. 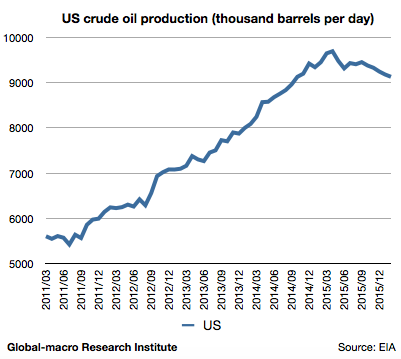 It is not possible that the production eternally decreases as the price goes up, but if the markets misunderstand the decrease as a long-term trend, the oil price could exceed the long-term top for a while. The second is Saudi Arabia. Saudi Arabia is planning the IPO of Saudi Aramco, the government-owned oil producing firm of Saudi Arabia. It is possible that the country would try to direct OPEC to support the oil price, in order for it to sell Saudi Aramco at a better price. 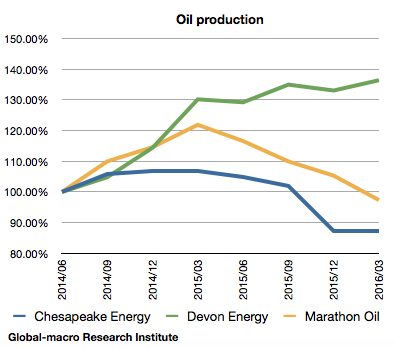 However, the markets will eventually face the fact that the shale oil industry would not die at the price around $50. We will short sell the crude oil futures when the price comes near $60. It would also balance our portfolio that includes buying gold, as buying gold and selling oils are the opposite bets against the dollar. We love balancing our portfolio.